Weather: 70°F in the morning with a high dew point; got up to 90°F. Mostly cloudy in the morning, partly cloudy in the afternoon. Pretty much the same weather as the last two days. 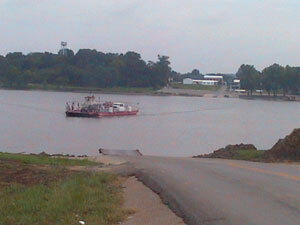 I had some breakfast at a restaurant in Dixon, Kentucky (population 532) at a small restaurant. Everyone who walked in the door was greeted by name. I was definitely an outsider. A group of six or so farmers had all sorts of questions about my rig and my trip. They went on talking about the weather and their crops once they were satisfied that I was crazy. I wanted a good stack of pancakes but saw they were $2.00 each, which was much more expensive than I have paid recently. I figured that I could get by with two since they were so much money. The waitress asked, "Are you sure you want two?" I took that to mean she thought I could eat more. I assured her that two would be fine. When they brought them out I found out what she meant - they are huge! Each pancake is about 11" in diameter and 1/2" thick and overflows a large dinner plate. I could barely eat both and usually would only be able to eat one. I've never seen such huge (and delicious) pancakes in my life! Another milestone day: I made it to Illinois. This is the third state in my journey but it will be a short one. 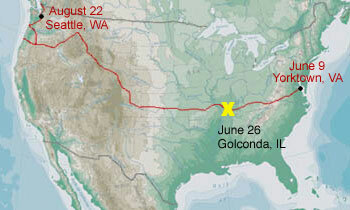 In two days I'll be in Missouri and should be in Kansas by July 3rd. 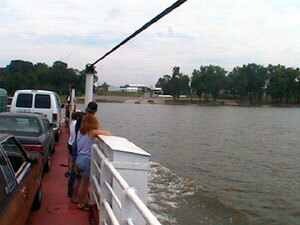 The pictures below show the ferry coming to the Kentucky shore and then some pictures while I was on the ferry. 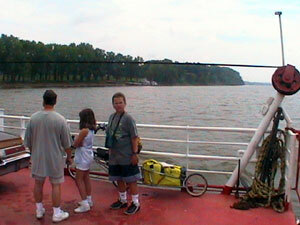 The Ohio River is about 0.5 miles wide at this point and the ferry is free. If you follow the river upstream for a few hundred miles you run in to Pittsburgh, Pennsylvania. Cave-in-Rock state park is nearby but I didn't visit. It has an intriguing history and was once home to many frontier era outlaws. Not much of a welcome to Illinois, is it? 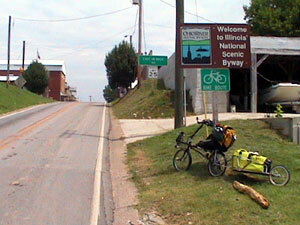 The Illinois National Scenic Byway that they advertise was neither scenic nor a byway. 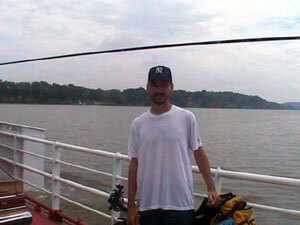 The first eight miles or so was a rough, windy, hilly two-lane road that wasn't very scenic at all. Kentucky put rumble strips on all their shoulders. Illinois doesn't even bother with shoulders. They basically make the roads just wide enough to put a white line along the edge and then use gravel as a shoulder. I shouldn't have complained about Kentucky's rumble strip shoulders because they at least gave me an extra foot of space to pull over if needed. It's a little more crowded riding on roads here and the shoulders are not forgiving for a loaded recumbent. So far the roads are very hilly here in Illinois but I've only gone about 25 miles so far. We'll see how much better (or worse) it gets. Today was hot and humid and I was absolutely beat by the time I reached Golconda. I haven't been this run down in a few days. I stopped off at the post office to take care of some mail, pushed my bike up a stupid steep hill to the motel, got a shower then walked back down the hill to get some chow. The restaurant was also a convenience store, video arcade and movie rental store. Small town entrepreneurs sure know how to milk everything they can out of a small shop. Motel: $38.50 and worth every penny!